DV Case 4. Click on image for enlargement. What is the base rhythm? Is there evidence for sino atrial block? What is the cause of the pauses in the heart rhythm? Is there a pacemaker indication? what is your next step in your workup? The rhythm shows inverted P-waves in the inferior leads indicative of atrial rhythm. The answer on this question is difficult. An atrial rhythm can be the result of SA block. 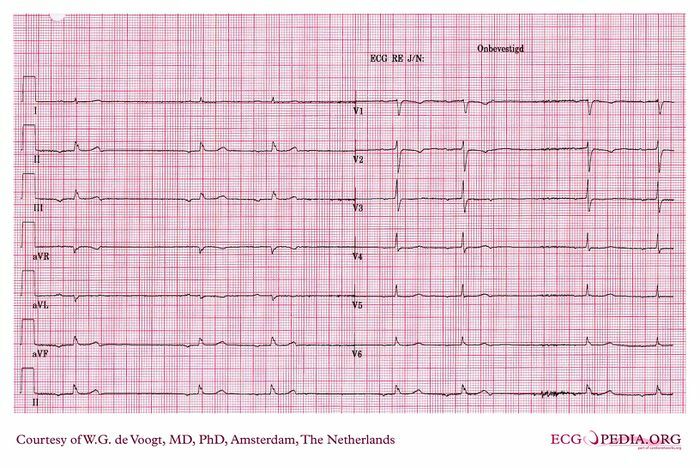 This ECG however cannot produce the proper answer. The use of beta-blockers for instance, could cause a marked lowering of the sinus rhythm, allowing for an atrial escape rhythm, which is slow as well. The cause of the pauses in the atrial rhythm are atrial premature beats, blocking the exit of the atrial prevailing atrial rhythms. These atrial premature beats can be appreciated when looking at the T-waves of the conducted beats preceding the pause. This question cannot be answered on this ECG. Pacing could be indicated as the patient has dizzy spells. However, blocked atrial beats per se are no pacemaker indication. a long term ECG recording. measuring the sinus node recovery time is questionable. This page was last edited on 27 April 2009, at 05:08.